The IASOA Radiation Working Group spearheaded an effort to describe the radiative impacts of Barrow's anomalous spring weather. IASOA contributing scientists Bob Stone, Diane Stanitski and Chris Cox worked with George Divoky and Craig George to relate these phenomena back to changes in the Barrow ecosystem. Highlights listed below; the full story can be found [here]. Spring came early this year, breaking several records at the top of the world in Barrow, Alaska, according to a new report that combines observations from NOAA, the North Slope Borough and a scientist who has tracked an Arctic bird for the last four decades. Barrow experienced its warmest May on record, averaging 28 degrees Fahrenheit, which is nearly 9 degrees above the average for the last 90 years. The snow disappeared from the NOAA Barrow Observatory on May 28, the second earliest date since records began some 73 years ago. The only year it was earlier was in 2002, when snow disappeared on May 24. A black guillemot bird laid its first egg on June 8, the earliest in the 40 years that George Divoky of the Friends of Cooper Island has observed these Arctic seabirds. Ice completely disappeared from the Isaktoak Lagoon in Barrow on June 27, the earliest date recorded since 1986 when Craig George, the senior wildlife biologist for the North Slope Borough, began tracking the lagoon’s ice status. The 73-year time series from the NOAA Global Monitoring Division’s (GMD) Barrow Observatory (BRW) in Alaska nearly set a record with the second earliest date of snow melt in 2015 (black line). 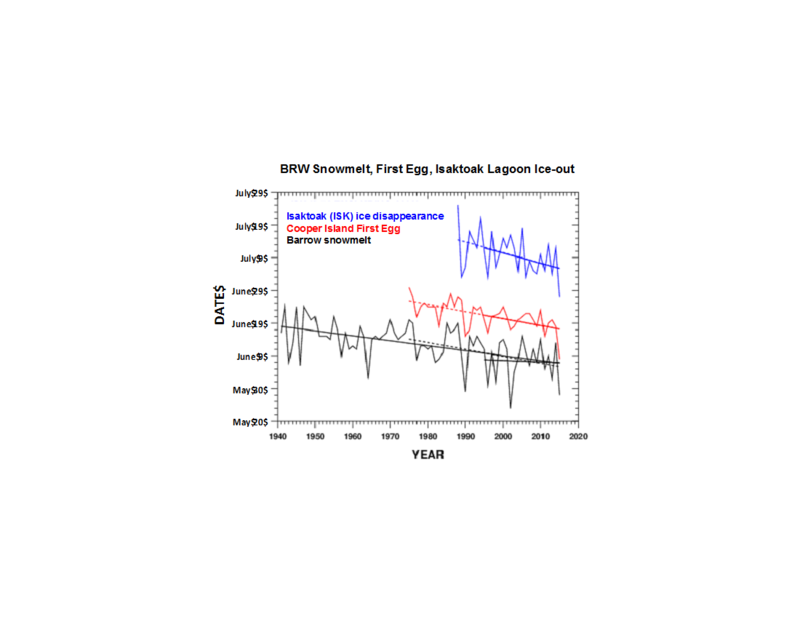 The earliest ice-free conditions on record were experienced at the nearby Isaktoak (ISK) lagoon (blue line). The first egg laid by the Black Guillemot bird on nearby Cooper Island was the earliest in the 40-year record (red line). “First egg” data courtesy of Friends of Cooper Island, http://cooperisland.org/).